SAVE $10 on our best of the best! 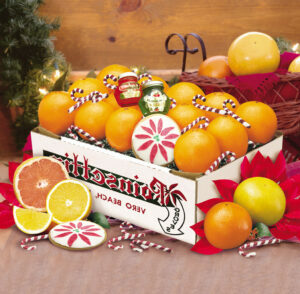 This cheerful gift includes our classic Navel Oranges and worldfamous Indian River Ruby Red Grapefruit, a frosted Poinsettia Cookie that’s almost too pretty to eat, two signature Marmalades, and an assortment of Holiday Candy. Looking for all Navel Oranges? Click here. Looking for Grapefruit? Click here.